Often, companies tend to face market wide challenges in supply chain management. Developing an effective solution for this kind of scale might be a difficult task for a single partner within the value chain. Hence, it becomes necessary to develop deeper partnerships with your suppliers to help grow each of your businesses. Creating a mutually beneficial strategy can be tricky, but with the right planning and strategies in place, it is easily attainable. Here enterprises must lay the focus on clearly defined, revenue sharing-based, and easily trackable KPIs, and information transparency. Furthermore, they can also develop a coalition charter that outlines the arrangement in detail. In this manner, firms can tackle issues in supply chain management at a scale beyond their current capabilities. Today, the IT department is tasked with both supporting daily operations and expanding the business operations. It is important for modern businesses to invest in new technologies that can help employees perform tasks in a much-simplified manner and in turn boost the company’s supply chain management. A training program should be aimed at teaching the workforce more than what the daily tasks that they are expected to perform. It is vital for companies to share their comprehensive plan to the employees in order to increase productivity while reducing costs. The workforce must be trained on the importance of internal and external customer service. It is also important to incentivize them to act in accordance with your business’ vision, mission, and values. 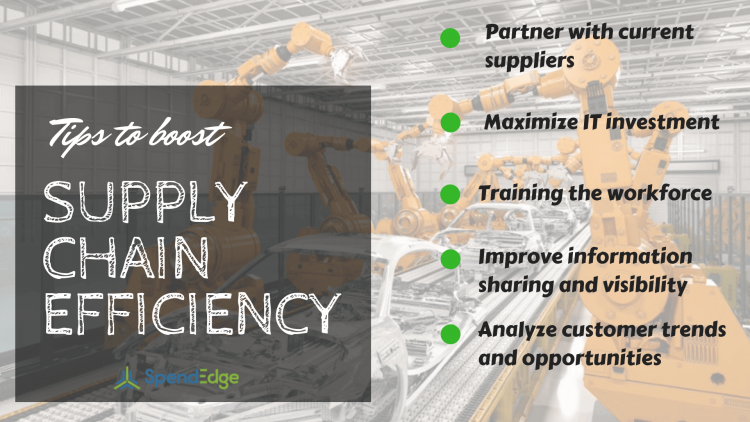 Sharing this and training will drive a successful organization by creating aligned goals while improving supply chain productivity. Transparency is an essential ingredient to determine the efficiency of operation in supply chain management. Furthermore, it is high time that companies eliminate slow, unreliable spreadsheets to provide information. Rather they must share up-to-date information through current technology solutions. Other ways to increase information sharing include taking advantage of big data analytics, measuring supply chain metrics regularly, and also involving employees in identifying inefficiencies in the system. By keeping the workforce and the clients informed, companies can create opportunities for innovation. Supply chain managers must keep a constant watch on the trends and opportunities in the market. This will not only help them be in line with the newest market opportunities but will also consequently improve the overall supply chain management and its efficiency by adopting innovative techniques to cater to customer demand.